It is that time of year again – when young scientists come together to present their science projects at the Ottawa Regional Science Fair. On March 31st and April 1st, 2017, students from grades 7 to 12 from the Ottawa-Gatineau region presented science projects attempting to answer a number of questions. Is it possible to buffer ocean acidification with baking soda? Can cilantro remove lead from contaminate water? Can invasive plants be used to absorb oil in a marina? Every year, the OFNC presents awards to the creators of two or three outstanding projects that “demonstrate a knowledge of some aspect of natural history, field ecology, or wildlife conservation.” I have judged these projects with Kathy Conlan, a research scientist at the Canadian Museum of Nature, for the past three years. Students nominate themselves for the award, and this year there were 16 entries. It was wonderful to see so many projects tackling environmental issues! This year’s OFNC award winners were Daniel Anderson, for his invention to provide housing for pollinators ranging from bees to beetles and lacewings (“La demeure des pollinisateurs”); Julianne Jeger, for her project examining which type of road salt had the least impact on plants (“L’impact du sel de route sur les fleurs sauvages”); and Ryland Ferrall, for his project demonstrating the effectiveness of the polyphenols in tea for slowing the spread of oil during an oil spill (“The Polyphenol Effect”). Each project was awarded a $100 prize. Congratulations to Daniel, Julianne, and Ryland for their exceptional projects! Earlier this year, the Ontario Ministry of Natural Resources and Forestry (MNRF) released proposed changes to the hunting regulations for the province. Among them was a proposal to shorten – but not end – the hunting period for the Snapping Turtle. The hunting of turtles is rarely sustainable given their life histories. Snapping Turtles take about 20 years to reach maturity in Ontario, many of their nests are predated by Raccoons, and they face ongoing threats of wetland loss, traffic mortality (often adult females looking for places to nest), and persecution by people. Given all these factors, many people were upset that the MNRF was not going to end the hunting of Snapping Turtles in Ontario. Many organizations, including the Ottawa Field-Naturalists’ Club, Ontario Nature, and the David Suzuki Foundation mounted a campaign to encourage people to tell the government that the Snapping Turtle should not be hunted. Over 13,000 comments were submitted on the proposed hunting regulations and the effort paid off. In the revised regulations, posted on March 31, the government of Ontario had removed the Snapping Turtle from the hunting list. Thanks to everyone who urged the government to end the hunt. This is a great victory for the Snapping Turtle and everyone who took the time to write to the government about this issue. It is also a powerful lesson to those who care about nature. Current events in the world, particularly south of the border, can make it easy to believe that things are hopeless. But governments do listen to people. When we join together, our voices can be heard and public policy can be changed. It is not always easy, but persistence can pay off. Slow and steady can win the day. According to Fred Schueler, Kemptville Creek, just below the dam at Oxford Mills, is the only place in Ontario where our giant aquatic Salamanders can be easily viewed during their winter activity. Searching for salamanders at this site is a regular weekly event for Fred, and he has records dating back to 1984. On Saturday, 18 February, OFNC members joined Fred and Aleta from 7 to 10, wading in the cold water with flashlights and headlamps. Once again OFNC members got together to share their passion for nature and nature photography. And once again, we discovered the amazing range of interests and experiences Club members explore. We could have used even more time than the three hours scheduled for this event. Each presentation by the ten participants was interesting and informative and the photography was excellent. Organizers Hume Douglas and I never really know until the evening starts just how many presenters we’ll have and what they are presenting, but we’ve been more than happy with results every time. a grizzly in northern BC. We visited another north with Gordon Robertson, who explored birding spots around Edinburgh, Scotland; good thing he had a map! Jakob Mueller warmed us up in Cayo Coco, Cuba. His specialty is reptiles, but he started off with several fascinating Cuban endemic birds, including the Bee Hummingbird aka the world’s smallest bird, pictured here, a very difficult subject to photograph. He explained that birds are reptiles, too, before getting down to the lizards and snakes. Justin Peter’s video account of Demoiselle cranes took us to India, a highlight of a tour he had guided there last year. He told us the story of a field, famous for attracting these large birds in their thousands. Would they turn up or not – the tension mounted! We criss-crossed Canada as well. In addition to mentions above, Doug Luoma captured memorable wildlife at Mud Lake in his 10-minute video. In addition to his photo grabs here, he showed rare footage of several species of nesting woodpeckers, including their various calls. Barry took us to his family home-away-from-home in rural eastern Prince Edward Island, focusing on the rich variety of arachnids there, including several species of crab, jumping and orbweaving spiders. He was surprised how many people admitted liking these critters… Owen Clarkin continued his explorations of the trees of eastern Ontario; showing the largest elms of the region and the rarer species. Lorne Peterson brought us back to his Ottawa backyard, filled with flowering plants from the FWG plant sales. These attract numerous pollinators, proof of the effectiveness of providing microhabitats for these threatened species. As in previous blogs, participants share their favourite photos. They provide a taste of the evening’s images and stories. We look forward to more next year. Thanks, everyone! I am high school student from Ottawa. At my school I run the environment club with a group of friends and have been involved with environmental leadership. When I saw an application for a grant to attend the Ontario Nature Youth Summit for Biodiversity and Environmental Leadership, I decided to go for it and apply. When OFNC told me that I had received the grant and would have the opportunity to attend the summit I was excited; I could not wait! I attended a number of workshops ranging from different topics over the course of the summit. In “Livin’ La Vida Local” I learned about the impact of eating local and different programs put in place to making eating local easier. This workshop was hosted by Youth Council members who had faced challenges eating local especially while at university. There was also a workshop about emotional intelligence that I really enjoyed. Matt Tod, the speaker, talked about what emotional intelligence is and how to become aware of it. In this interactive workshop, we learned what the qualities of a good leader are. This provided us with many tips to improve our leadership skills to become better environmental leaders at home. During our weekend in Orillia an Aboriginal leader from the local community joined us. He brought all of us together with his captivating stories by the campfire and shared many important lessons. I also went canoeing one morning on Lake Couchiching. It was wonderful to be out on the calm water in the early hours. Some students went on a birding hike and others braved the cold water and went for the polar dip. Overall the summit gave me some ideas for my environment club and showed me different ways to protect the environment. Thanks OFNC for this opportunity! Snapping Turtles face many threats including the loss of wetlands, traffic mortality, by-catch from commercial and recreational fishing, persecution, and toxic chemicals. If that were not enough, the province of Ontario also allows hunting of Snapping Turtles. Right now, the province is re-considering the hunt. Submissions requesting the hunt be ended are urgently needed. In less than 5 minutes, you can submit your comments to the government and help protect Snappers. Below is the submission I helped prepare on behalf of the Ottawa Field-Naturalists’ Club. It provides more detail on why hunting long-lived species like Snapping Turtles is likely not sustainable. And below that are two sample letters you can submit for yourself. It is always better to personalize letters so it doesn’t sound like a form letter. Re-word a few sentences. Add a personal anecdote. Do even a little to make it your own. Or write your own letter. Make submissions via the Environmental Registry. Go to the Environmental Registry page. Click on the Submit Comments button. Fill out some contact info and then paste your submission into the comment box and hit save. It really is that simple. Comments are accepted until January 30, 2017. The proposed changes would shorten the hunting period and reduce the possession limit to two Snapping Turtles. Unfortunately this does not adequately take into account the biology of the species, or the recommendations in the proposed management plan. The management plan clearly states “Considering the reproductive strategy of the Snapping Turtle (i.e., delayed sexual maturity, high embryo mortality, extended adult longevity; see section 3.4 – Limiting Factors), harvesting (legal or illegal) of adults and older juveniles is especially harmful for wild populations” (sec. 4.2, p.14). Snapping Turtles in Ontario may take 20 years or more to reach maturity and any hunting and killing of the species must take into account such factors. Snapping Turtles have a suite of life history characteristics involving delayed maturity, high nest predation rates, but extended adult lifespan. This life history strategy is successful when adult mortality rates remain extremely low. Snapping Turtles already face significant threats in Ontario including traffic mortality, boating mortality, fishing by-catch, persecution, toxic contaminants, and habitat loss and fragmentation. Additional sources of mortality, such as from a legal hunt, are likely not sustainable in many areas of the province. Scientific studies on turtles are very clear that removal of adults will cause a population to decline and recovery may not occur even after a few decades. A Snapping Turtle population in Algonquin Park has been studied by the lab of Professor Ron Brooks for more than 25 years. It experienced significant “hunting” from River Otters in the late 1980s. Following the reduction in the adult population, there was no increase in clutch size, numbers of hatchlings and juveniles, growth rates, or adult recruitment. There has been no population recovery in the last 25 years. Under the proposed regulations of a daily limit of one Snapping Turtle and a possession limit of two, five people on a weekend hunting expedition at a cottage could take 10 Snapping Turtles from a single population. Removing 10 adults (particularly if they are adult females) could be catastrophic to many small or medium sized populations. The “Draft Small Game and Furbearer Management Framework for Ontario” states that the first management objective is “sustainable populations.” Yet the evidence based on the life history of the Snapping Turtle, the statements about hunting in the proposed management plan, and the allowable hunting rates in the proposed guidelines all clearly indicate that the hunting and killing of Snapping Turtles is not sustainable. If wildlife management in Ontario is to be science based, then MNRF should not simply restrict the hunt, but end it completely. Feel free to copy one of the following sample letters as your submission to the Environmental Registry. You can also borrow some text from the OFNC letter. A personalized letter always counts for more, so please make it your own by re-wording some sentences or adding your own thoughts. The legal hunting of the Snapping Turtle should be halted. Snapping Turtles are listed as a species at risk both provincially and federally. They face numerous threats, including road kill, loss of habitat and persecution from many people. Large numbers of dead Snapping Turtles are seen on roads every year during the nesting season and most of these are adult females looking to lay their eggs. This threat alone likely is causing some populations to decline. Additional sources of mortality, such as from a legal hunt are likely not sustainable. Please halt the legal hunt of this species at risk. The government of Ontario should end the legal hunting of Snapping Turtles. Snapping Turtles can take more than 20 years to reach maturity. Many of them die on our roads every June as females look for nesting sites. And the Snapping Turtle is now listed as a species at risk both provincially and federally. Why is the hunting of this species still allowed? Please end the hunting of this species to help ensure Snapping Turtles have a future in Ontario. Justin Peter, director of programs and senior naturalist for Quest Nature Tours and vice-president of the Toronto Ornithological Club, brought his extensive knowledge of fascinating Galapagos birds to the Ottawa Field-Naturalist Club’s monthly meeting this past Tuesday. Host to unique and interesting species, the Galapagos Islands are home to the swallow-tailed gull, the albatross, the Galapagos hawk, a variety of Boobies, and Darwin’s finches. 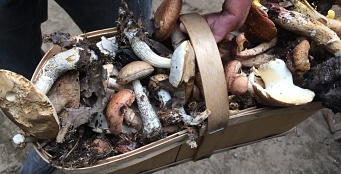 Although some of these species live on the islands year-round, others come and go with the seasons. Interactions between these species are varied. The Nazca Booby is known for its antagonism toward other birds and its general lack of intelligence. Darwin’s finches’ claim to fame includes the slight differences between birds of different islands, variations that were key to the development of Darwin’s theory of natural selection. 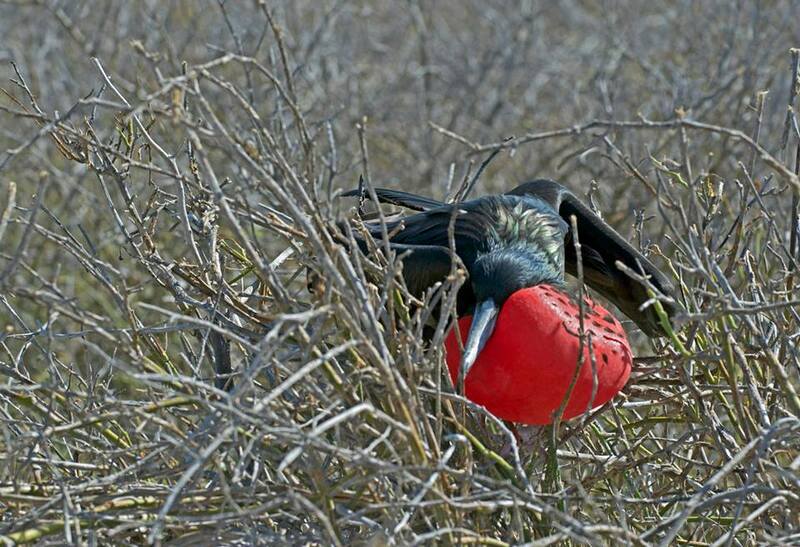 Overall, the Galapagos Islands host an impressive array of interesting birds. Whether of historical importance, or present day comedy, the birds found on the islands draw ornithologists from all over the world. Luckily for us, the natural seclusion of the Galapagos means none of the species found there have learned to be afraid of humans. 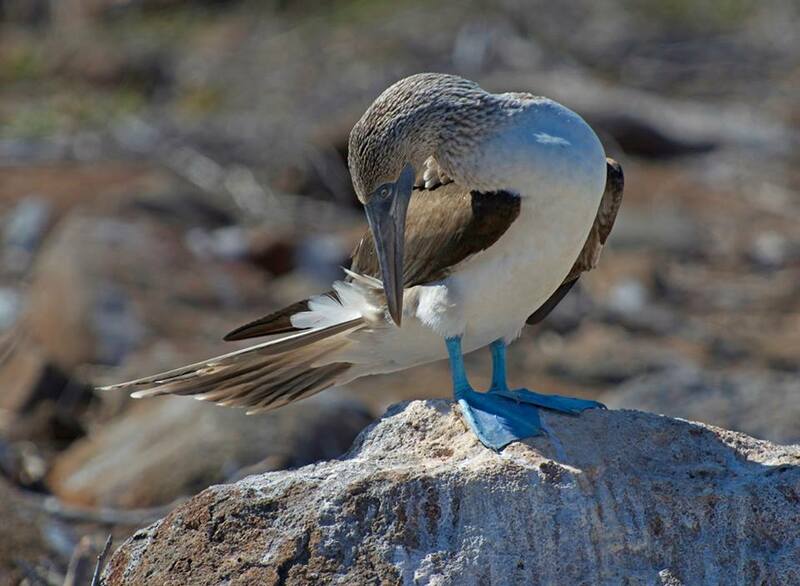 The Galapagos Islands are an incredible place to observe fascinating fowl up close. Dr. Micheline Manseau, an associate professor at the Natural Resources Institute of the University of Manitoba and an ecosystem scientist for Parks Canada, was the featured speaker at the OFNC meeting this September. She lectured on the iconic High Arctic Peary Caribou. Understanding the species’ origins and unique characteristics is key to the management and conservation of this fascinating animal. 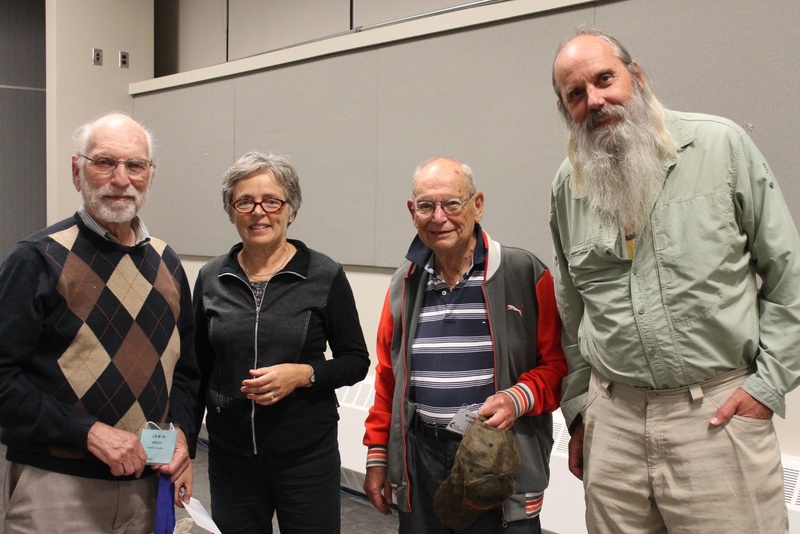 Dr. Micheline Manseau (second from the left) posing with club members (left to right) Irwin Brodo (former OFNC president), Murray Citron (OFNC poet laureate), and Michael Davidson. Contrary to popular belief, caribou and reindeer are the same species, Rangifer tarandus, but different subspecies. The Peary Caribou is a subspecies found in the High Arctic islands of northern Canada. Although unproven, there is strong evidence to suggest they descended from populations that survived in a High Arctic, unglaciated region. Peary Caribou were named after Robert Edwin Peary who is known best for his three attempts to reach the North Pole. He learned from Northern peoples and used animal skins and traditional food practices on his expeditions. Peary Caribou are small. Their short legs and large hooves are useful for dealing with the tough snow and ice that covers lichens and low-lying plants in the north. Peary Caribou are generally sedentary, but are known to move when necessary. Their main predators are wolves. Many Aboriginal groups have their own names for caribou. For instance, the Mi’kmaq word for caribou is “Qalipu,” meaning “an animal that shovels snow.” Caribou dig through the snow to find lichens, one of their primary foods. Dene people have different names for caribou found in different habitats.